I'm still working on organizing the paper collection, if you like, you can amuse yourself with this vintage TreasureTone slide. The Bertha Mae looks about as beat up as this slide! Is that the "prop" from the movies before they replaced her with a more reliable version? 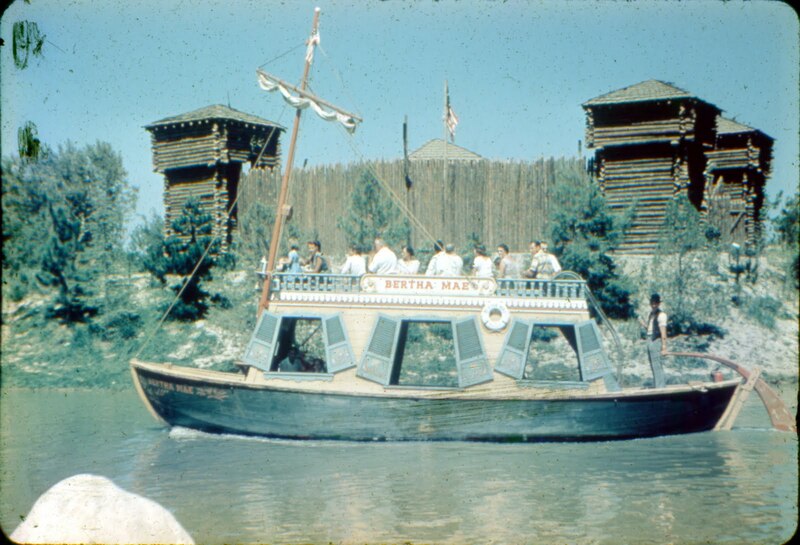 I miss this fort. 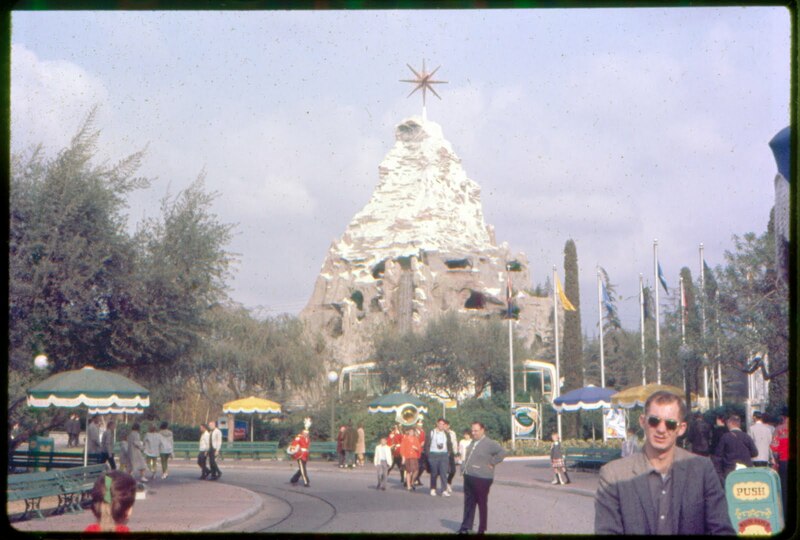 Welcome to Disneyland in Slides December 1962 - Part Four. 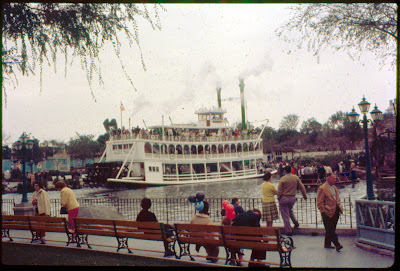 Sadly this is the last set of images from this batch. If this first one had more color and was brighter it would be post card worthy. 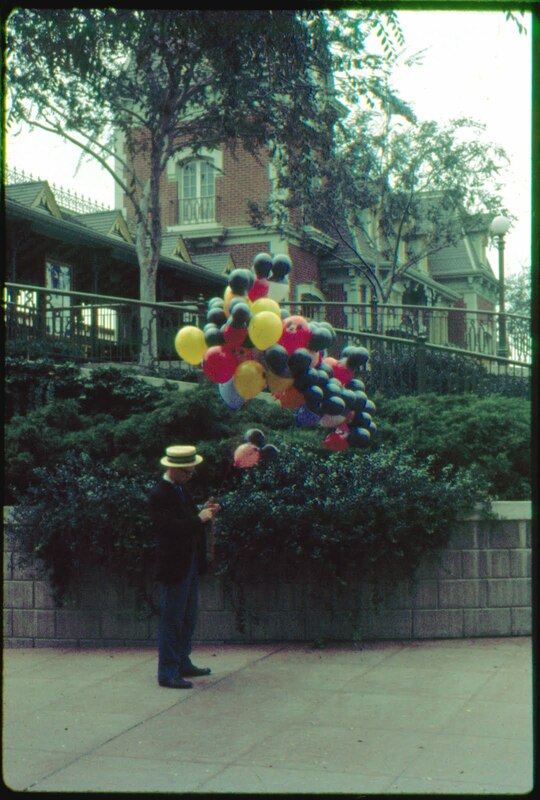 Is he counting his balloon strings/inventory? 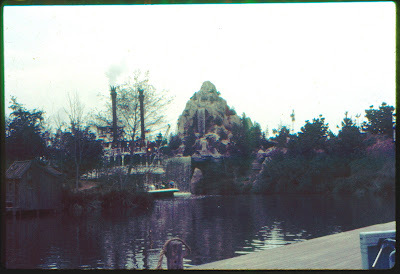 The next three are dull and lack sharpness, but this first one makes up for it with some construction walls in the background!!! I suppose I never noticed, but did the band used to wear red uniforms in the old days and when did they switch to white? 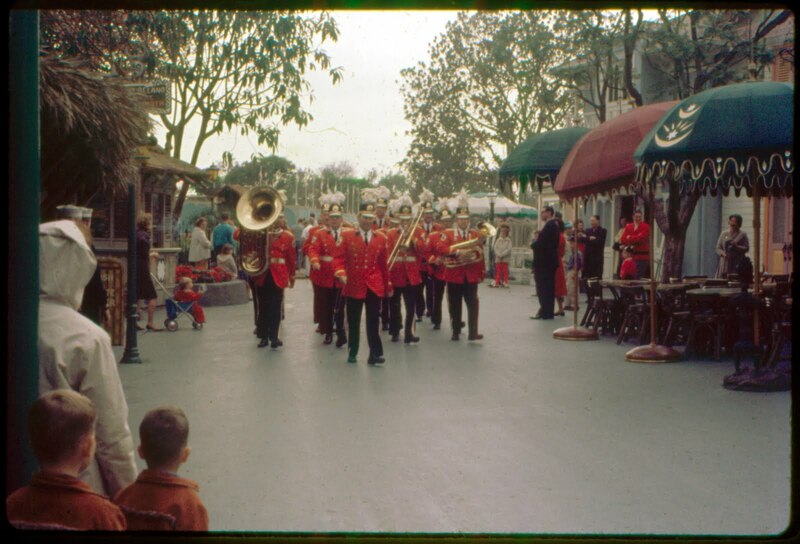 The band is heading through Adventureland? 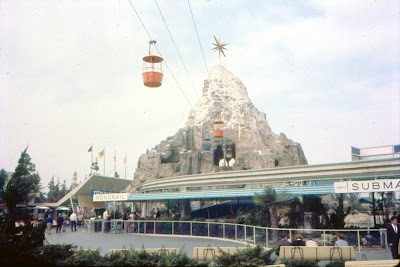 Ticket Booth on the left! Construction walls dead ahead! 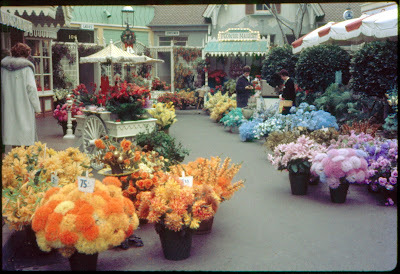 Are those for New Orleans Square in 1962??. Here's where it all ends. 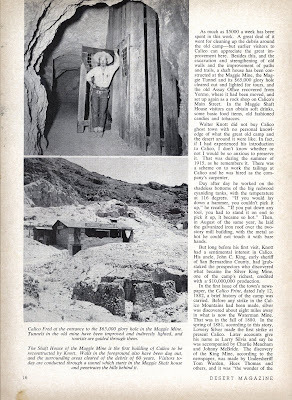 The man in the lower right looks very familiar, is it possible we've seen him in other slides? Or does he just have that "Ive seen him before" look? Believe it or not, the February 1959 set of slides (from this same photographer) are even better than these with one huge exception, they have lost almost all of their color, leaving lots of RED! 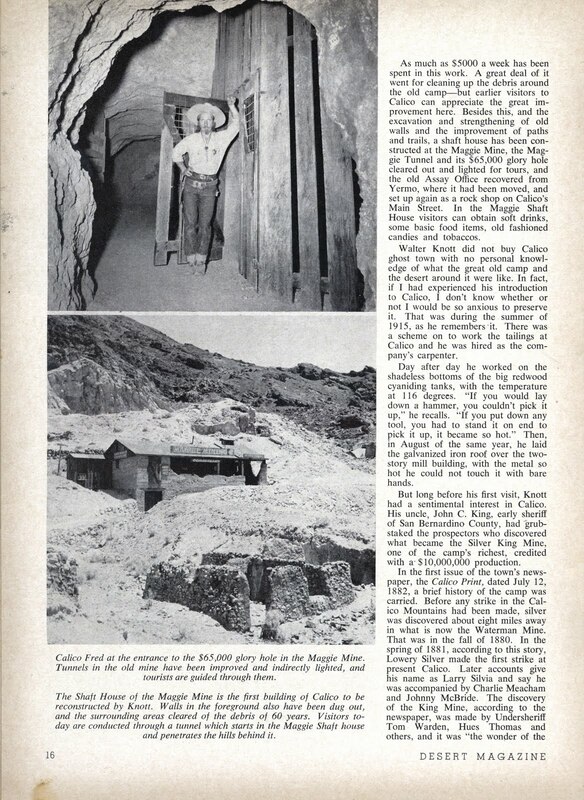 Hopefully some will be worth posting. 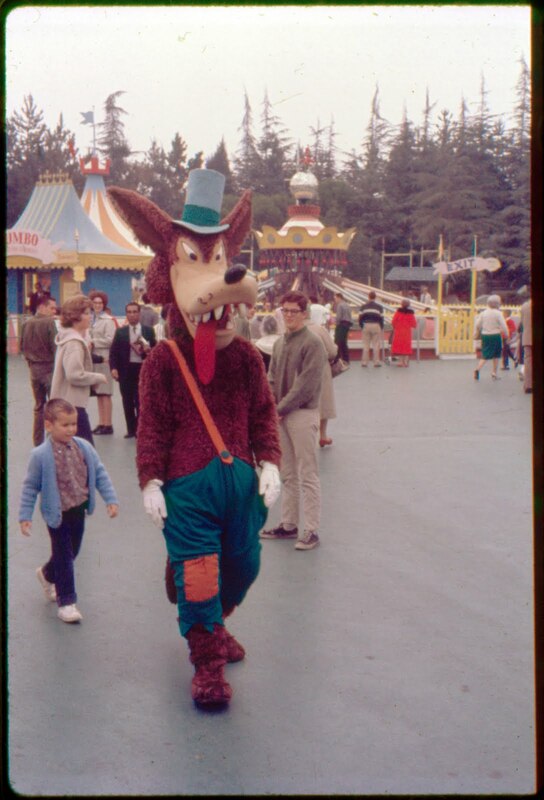 Part three from December 1962 finds us in Fantasyland still and now we've encountered the Big Bad Wolf. 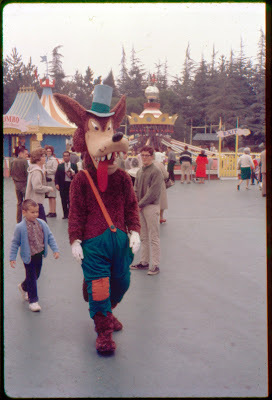 How many times during his shift do you think he bit his tongue? Meet "one of three"... Those disembodied arms are freaking me out! 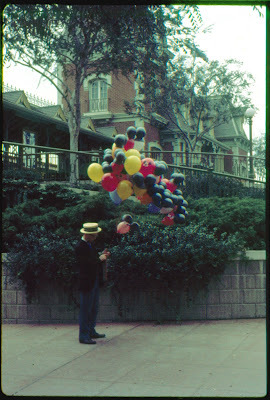 The next few images suffer from overcast conditions plus the low color saturation of this Ektachrome film stock. Here's one of the reasons Kodachrome looks so much more rich than Ektachrome: "Ektachrome is a subtractive process where all the colors needed are built into the film. 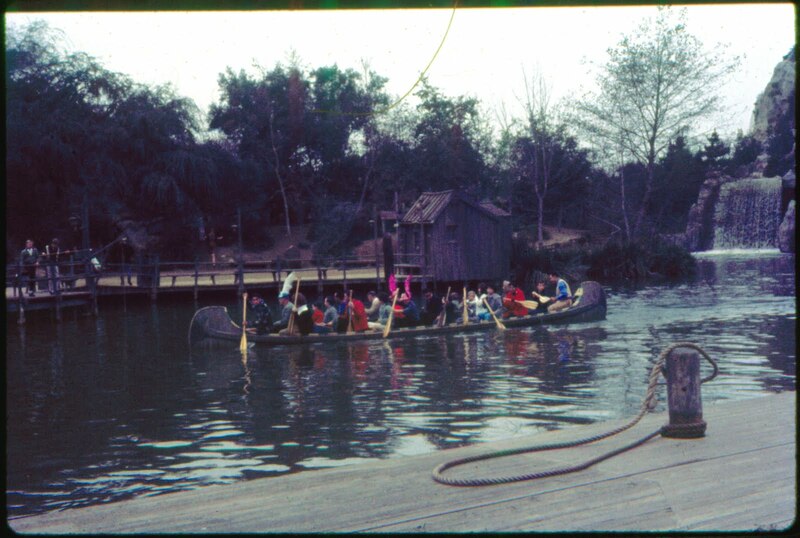 During processing, the "unneeded" colors are removed by the developer and the bleaches. 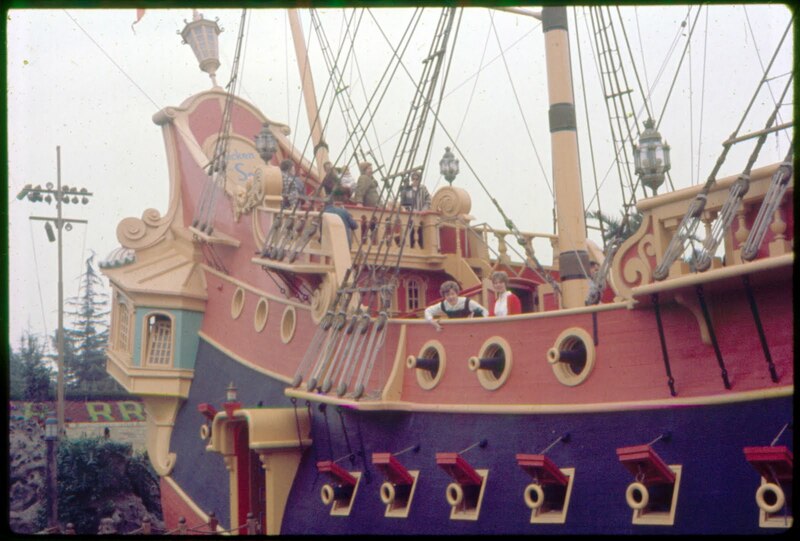 Kodachrome is a "dye additive" process so that whatever colors you photographed in your subject matter are applied during processing. 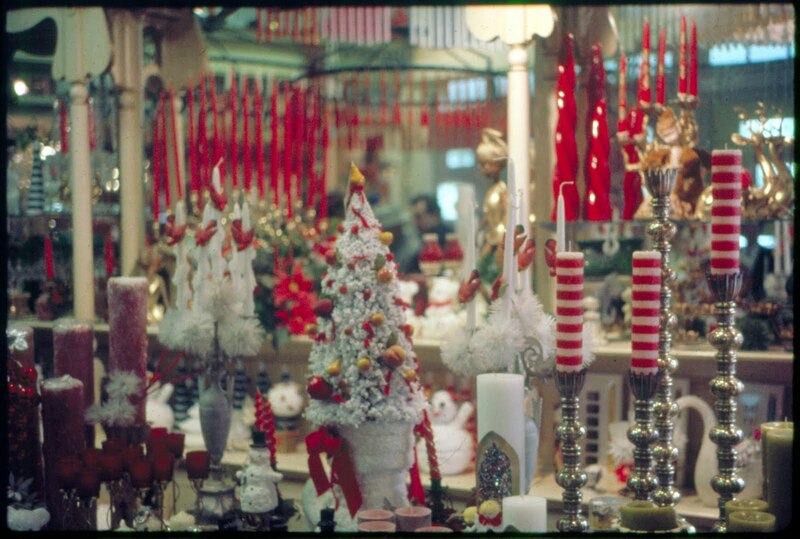 Kodachrome film basically "grabs" the colors it needs during processing. The dyes are very stable and don't fade with time. For example, look at 50 year old Technicolor movie prints...basically the same "dye-additive" process." The Twins are on deck! Now that's the kind of crowd I like. Where was this photo taken from, is the House of the Future just to the right? 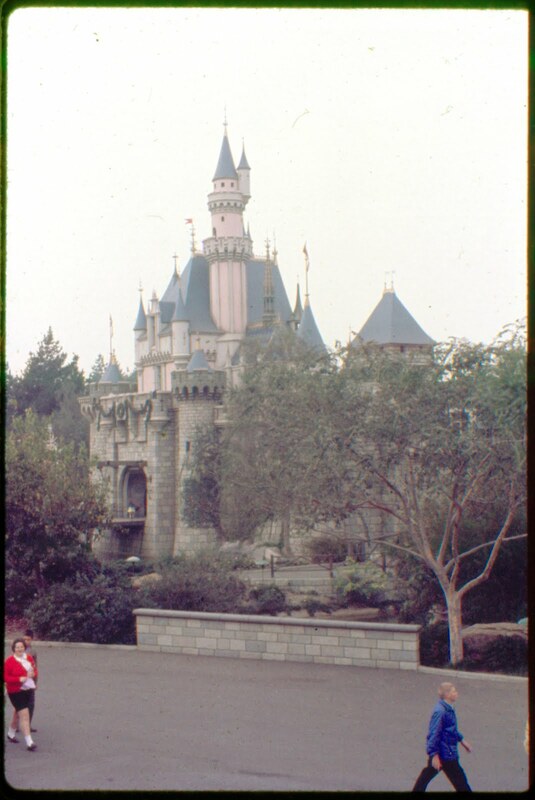 Notice the castle has its Christmas overlay, just like 2009. 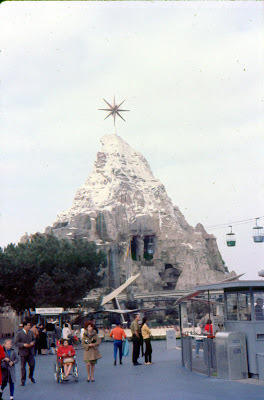 A cool December day didn't stop the Matterhorn climbers! 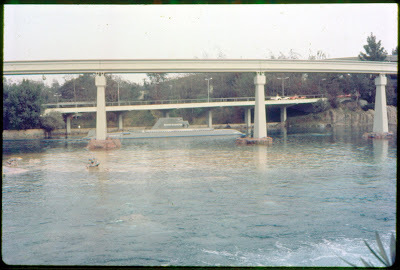 When did the brick bridge turn into rock work (link)? 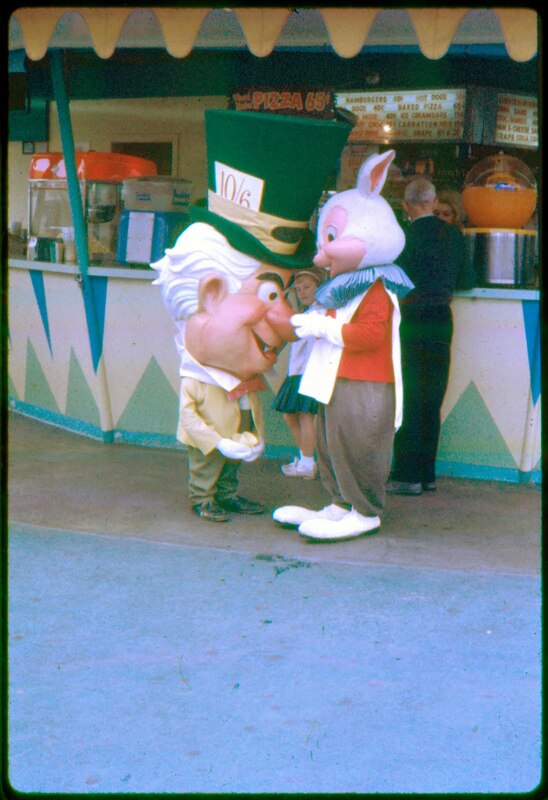 The past meets the future! 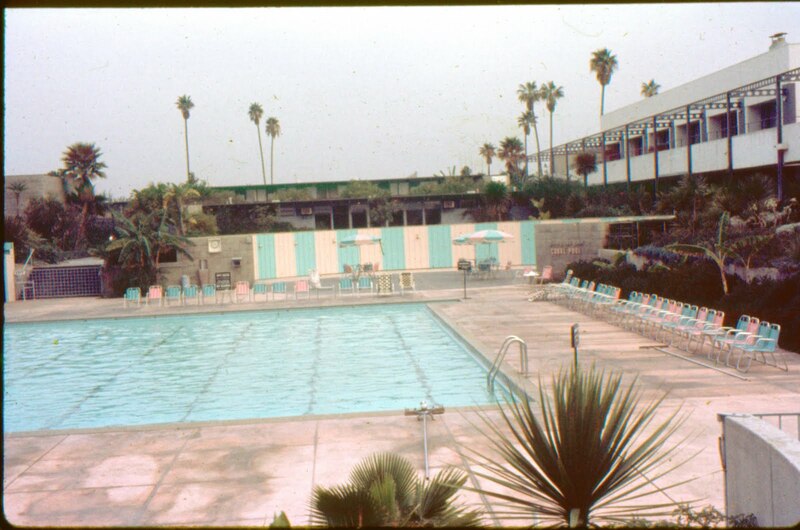 The color was way off on this slide, when I tried to fix it, it turned orange so I just left it alone. Is this the art corner? 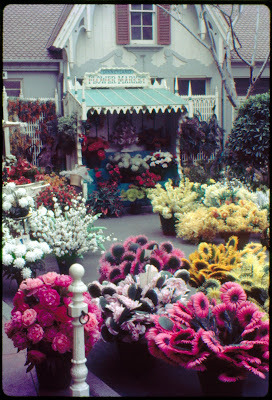 Here's a couple nice shots of the Flower Market. 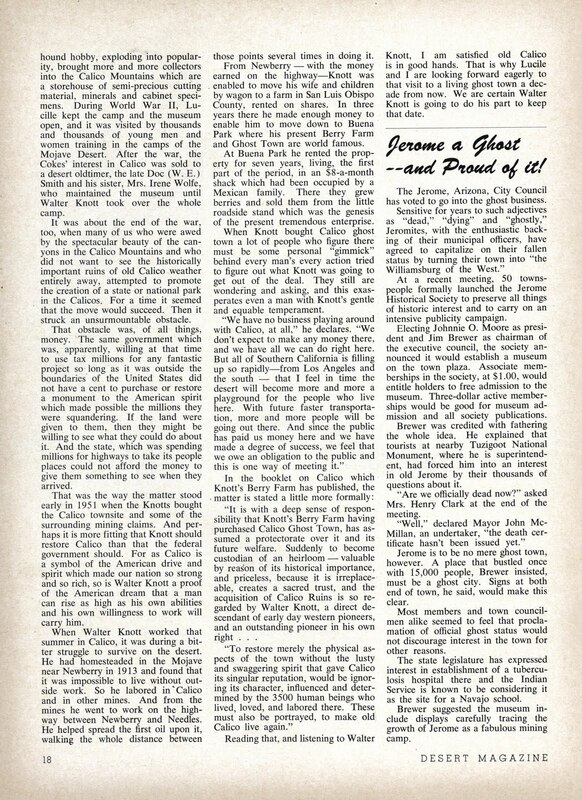 Come back tomorrow for part four. Welcome to part two of a visit to Disneyland – December 1962. 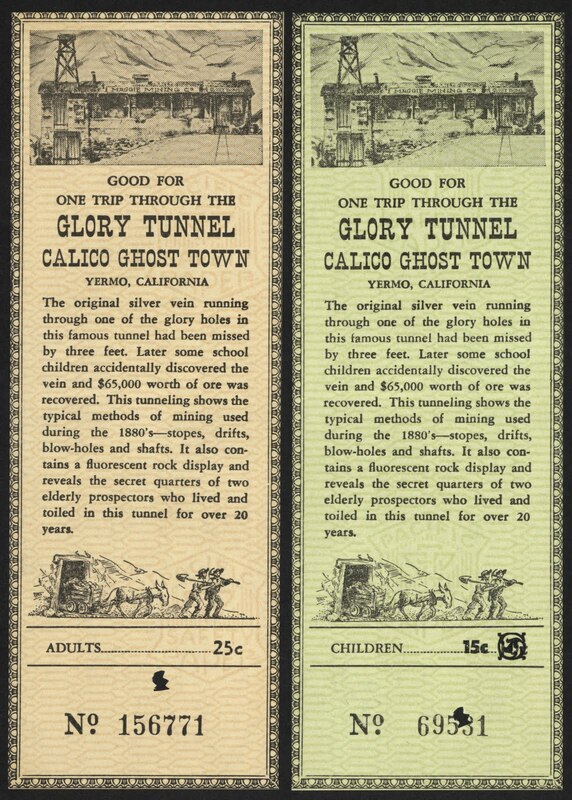 KatellaGate put it well in his comment yesterday “Actually these are great documentary slides” that's kind of what these remind me of. It’s as if the photographer was on a mission to capture the park and its attractions, with just a few “family shots” thrown in for good measure. 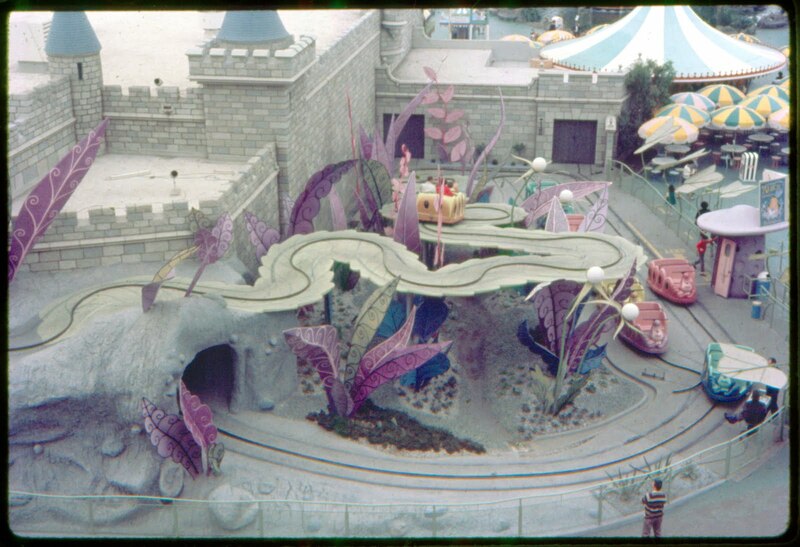 Up first a nice overhead view of Alice in Wonderland. 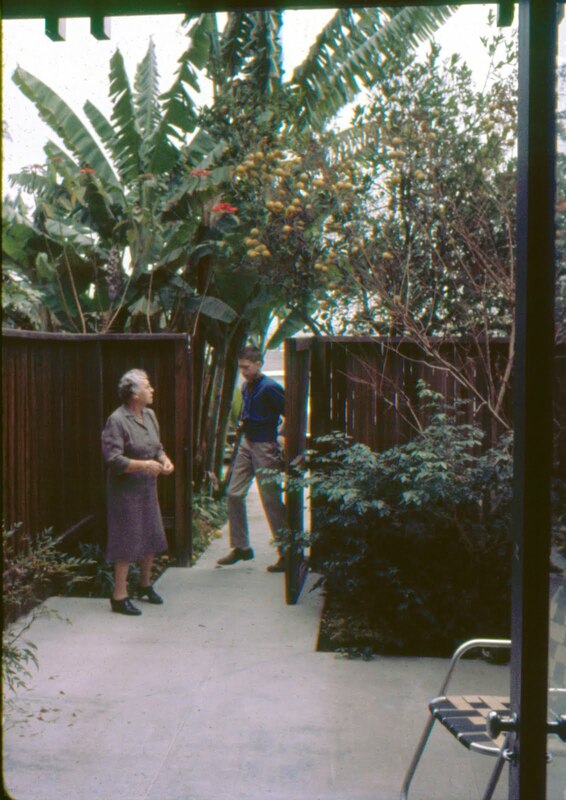 It’s hard to tell if the color is off because those giant leaves appear to be the same color that envelopes some of these old slides. Judging by the line (or lack of) I’d say this was a slow day at the park. 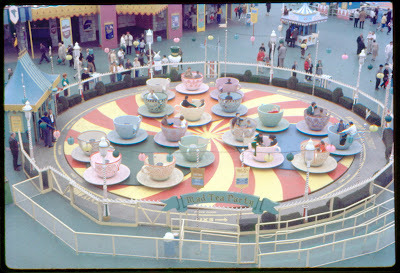 A nicely centered overhead shot of the Tea Cups. Can you see Hatter and Rabbit on the far side of the Tea Cups? You’ll see more on them in a few seconds. 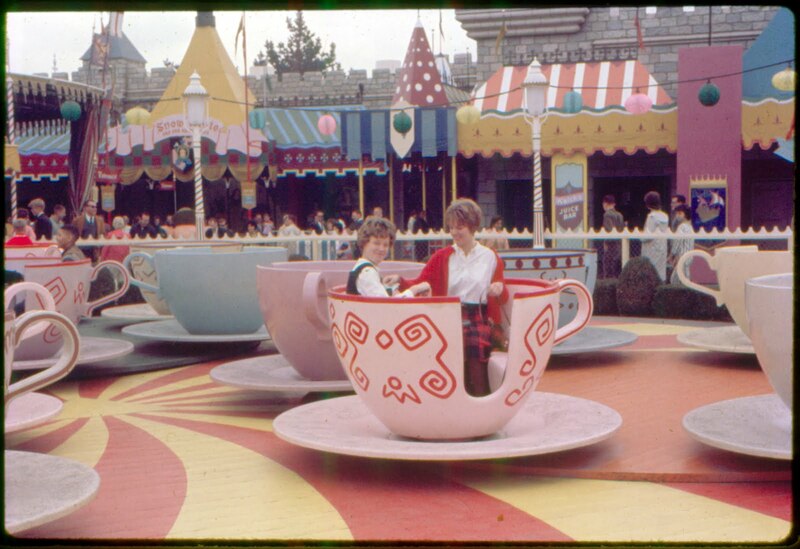 Great TeaCups in action shots. 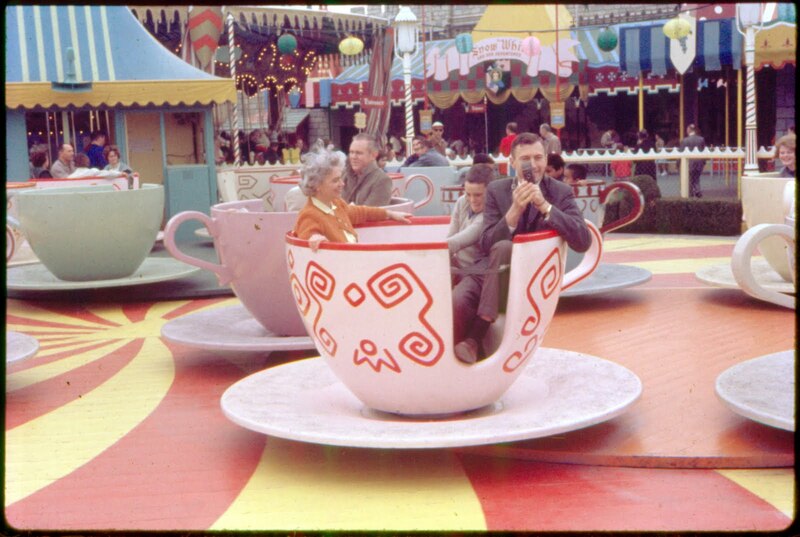 Here we’ve got Junior doing his best to spin the cup right off its axis, Dad holding what looks like a 1940’s regular 8mm movie camera, and Mom looks genuinely thrilled by the whole thing. 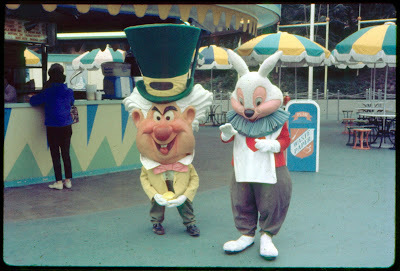 Side note; Mom looks remarkably like the current Mad Hatter that roams the park, coincidence? 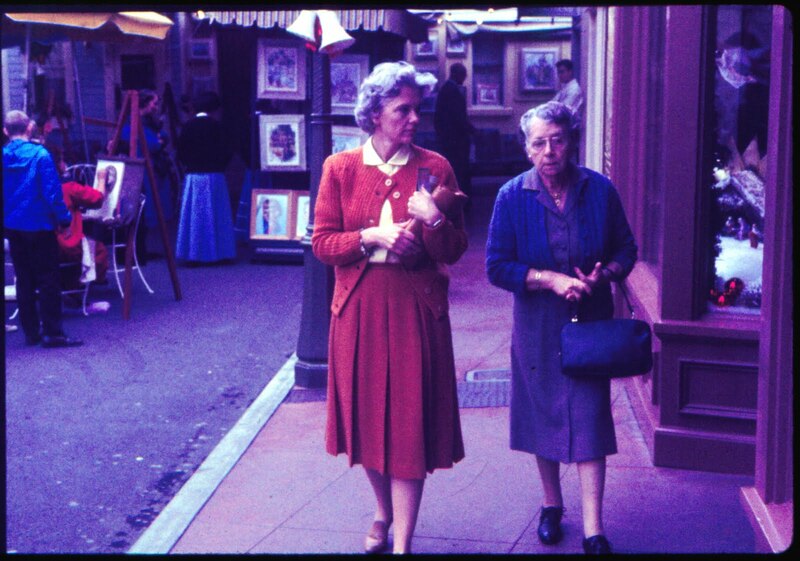 I’m guessing these two are the older daughters/twins? 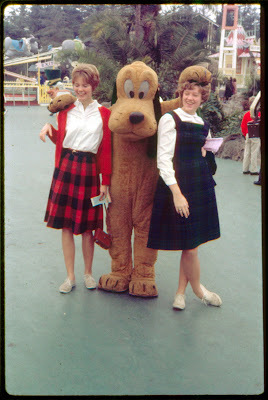 The one on the right wants to be a Tour Guide! Welch’s Juice Bar in the background – man do I miss those on a hot summer day. 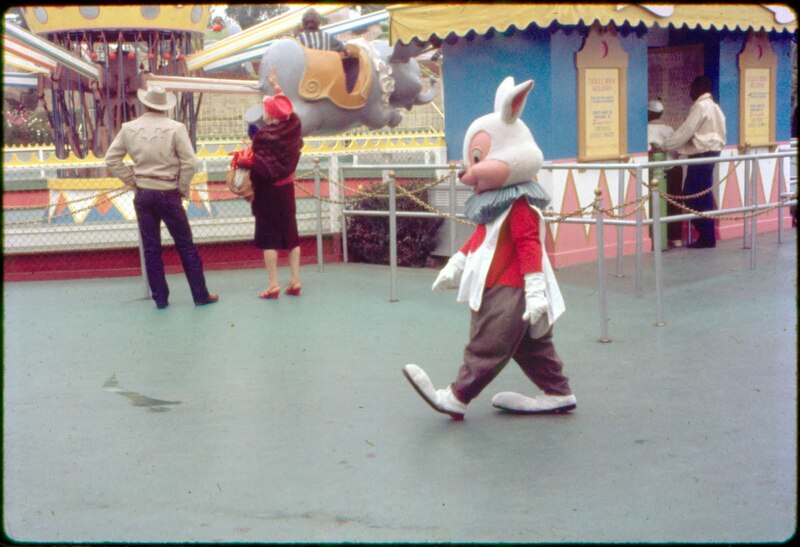 Rabbit walking all alone, no handlers, no guests… Lots of slurry. Is Hatter holding a tea cup? That’s an odd placement for his hands. 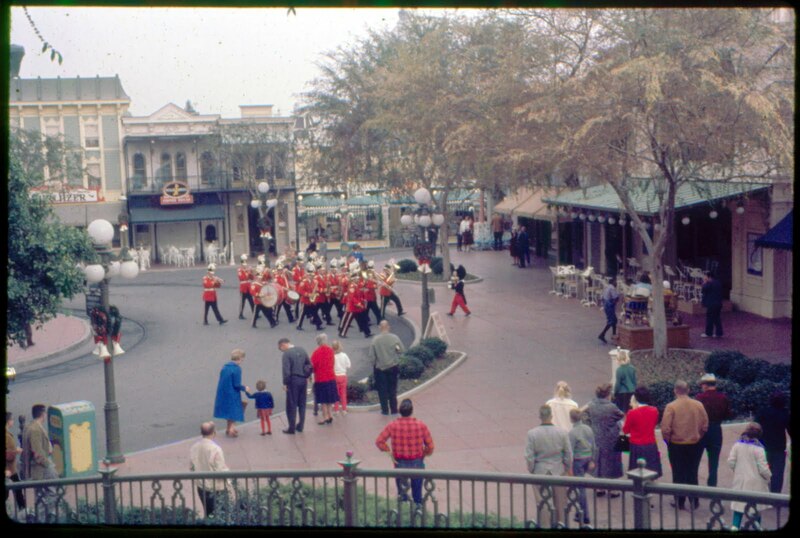 Come back tomorrow for part three as we finish up in Fantasyland and head down Main Street. In an effort to organize my ticket & paper collection (if you could see my blogger desk you’d scream!) I’m taking a few days to re-group. The next few posts will be me pretending I’m one of the big boy slide bloggers. 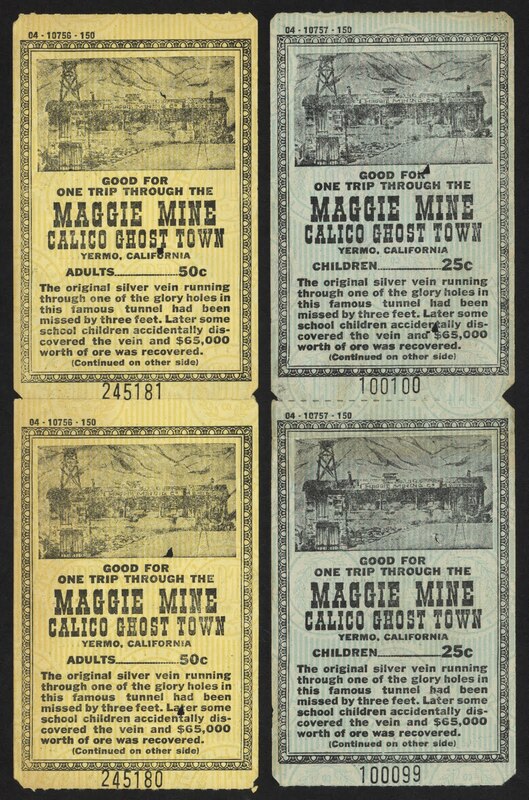 Every once in a while I’d bid on slides on EBay, but my self imposed limit of $10 keeps my wins far & few between. 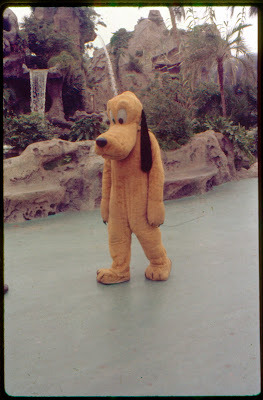 We should all be VERY thankful to the slide bloggers out there; these images generally do not come cheap. That said, I recently snagged a box of 120 "Mixed" slides for $5.50! It was poorly listed and showed a bunch of tame/boring Marineland slides, it only got one other bid so I wasn't really sure what to expect. 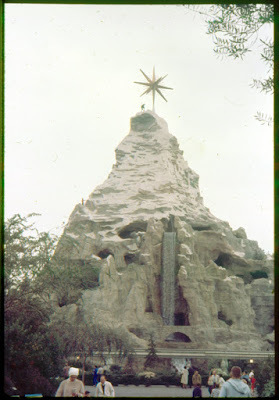 Turns out it was a pretty good deal with over 50 slides of Disneyland! The photographer pretty much kept to the attractions, just a few "guest"shots. 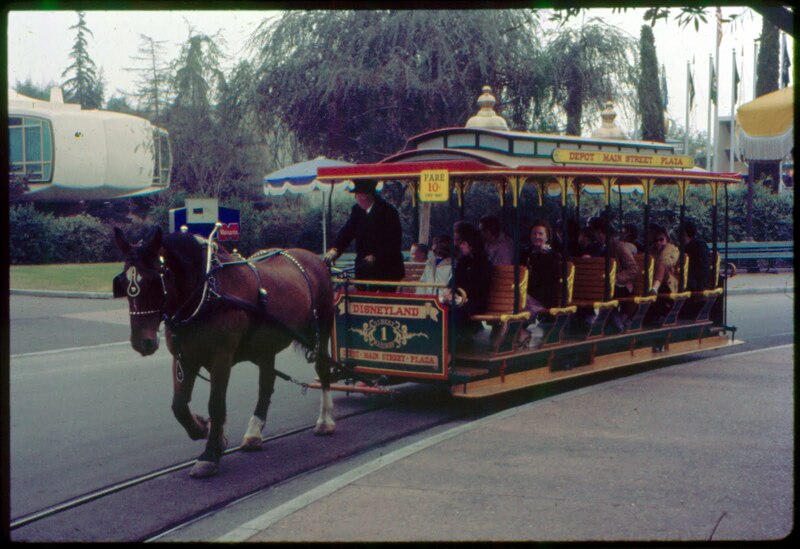 There are over 30 nice images of Disneyland from December 1962. 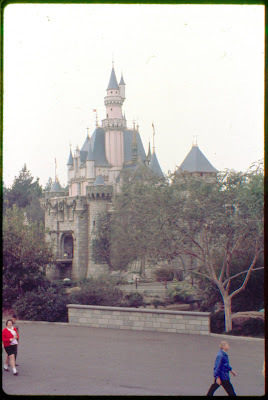 There are also about 20+ Disneyland slides from February 1959, those have turned rather pink but are excellent views. 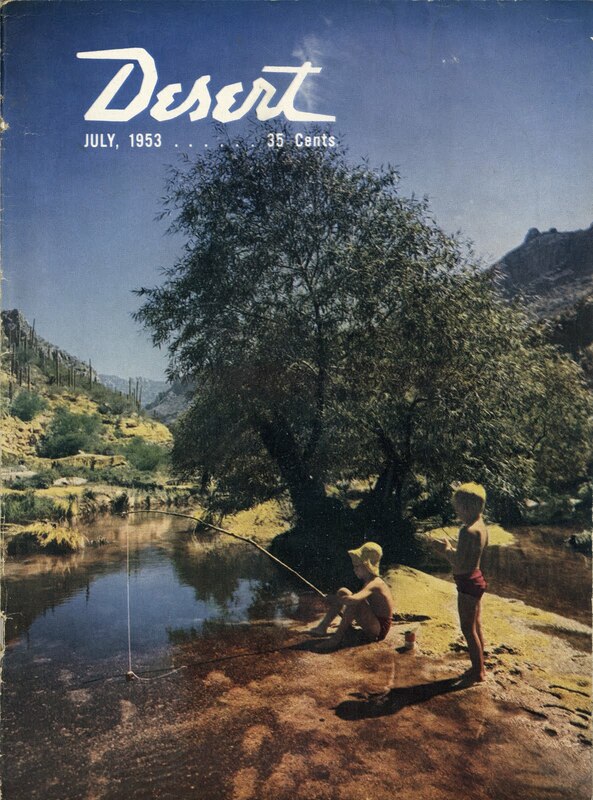 We’ll see about them later, but now let’s get started with the December 1962 batch. 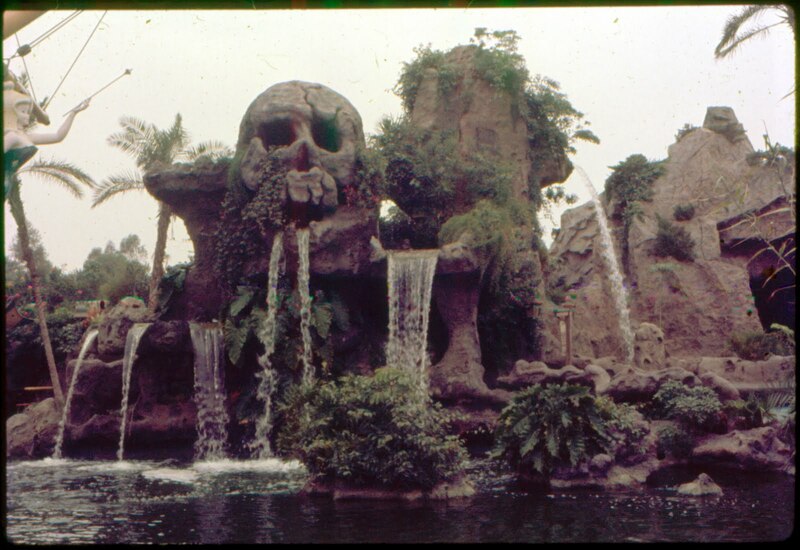 These are presented in the original (odd) order and with my mediocre scanning skills. I’m open to suggestions on how to improve these. They are “Kodak Ektachrome Transparency’s” that seem a little too “blue” I played with the levels just a bit. Looks like our December 1962 guests were staying at the Disneyland Hotel. 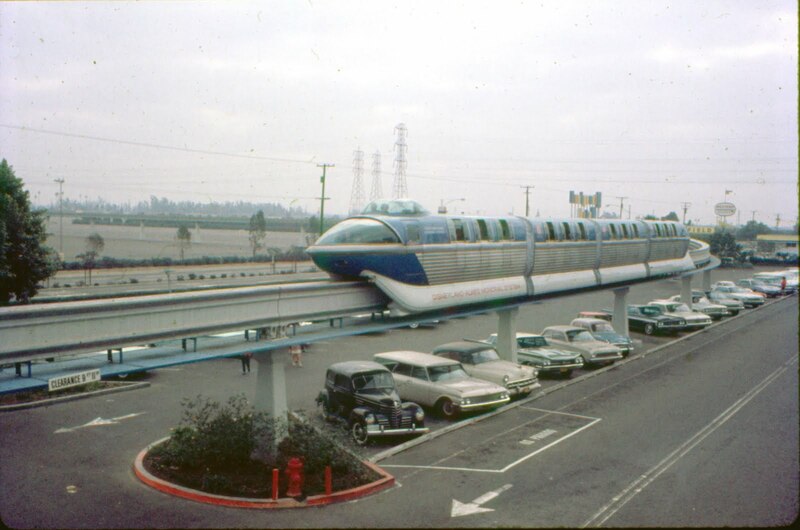 I’m a car buff but even I don’t know what the first car on the left is? 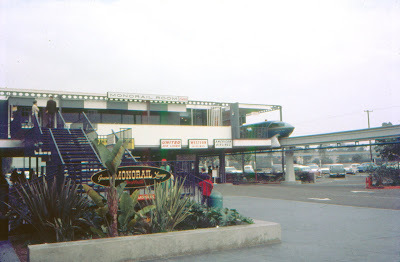 The Monorail Room and Monorail Lounge, were they the same place? This slide is marked “Vida & Marin Disneyland Hotel patio 12/62” is that an orange tree? Not many guests using the pool on this overcast day in December 1962. Unfortunately, it appears to be overcast in many of these slides, however they do offer an amazing amount of detail. 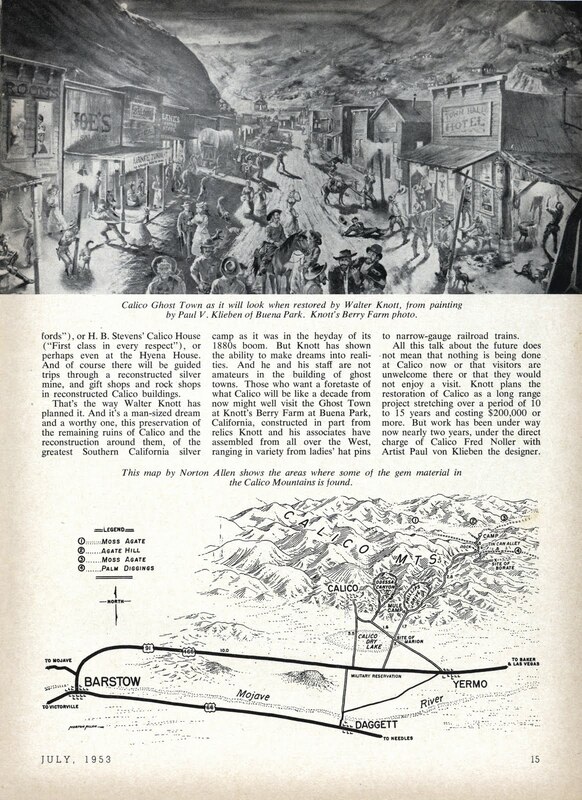 Guided Tour anyone? I don’t think I’ve seen the tour booth setup here before; did they do that for very long? Here’s a nice inclusive shot; Matterhorn (with star), Skyway, General Dynamics Subs, Monorail beam & sign, the Yacht Bar (club?) and vintage fence! 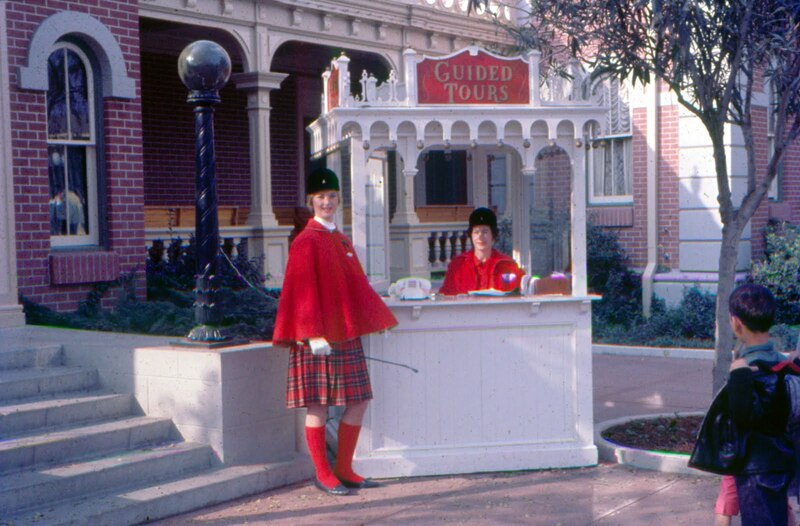 Tomorrowland central ticket booth spotted on the left! 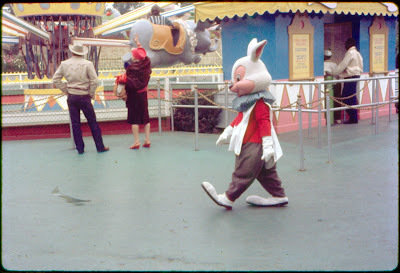 Rare early wheelchair sighting as well. 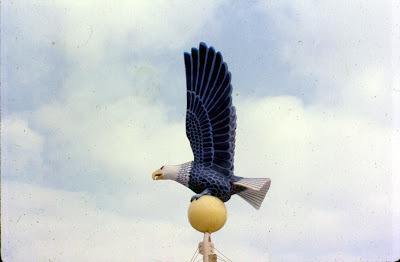 Nice close up of the Richfield eagle - but the slide is a bit dirty! 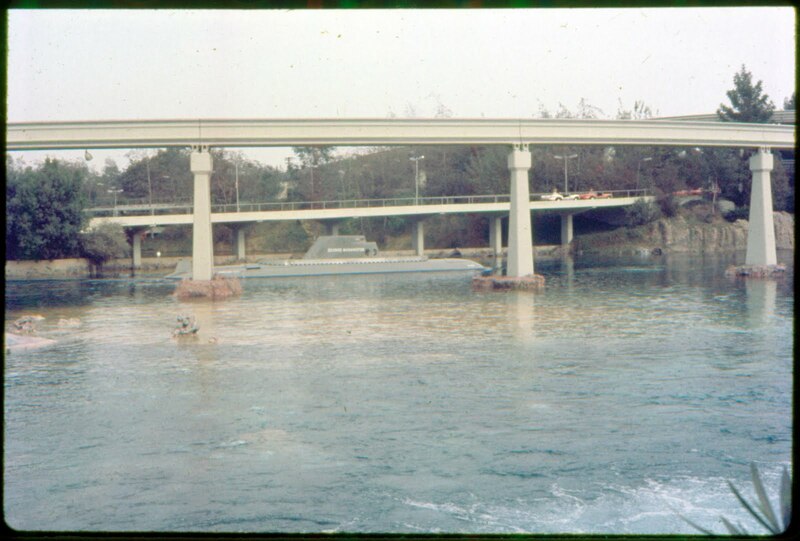 An "OK" shot of the sub lagoon, where's three fences? Douglas has hi-jacked the Rocket to the Moon. 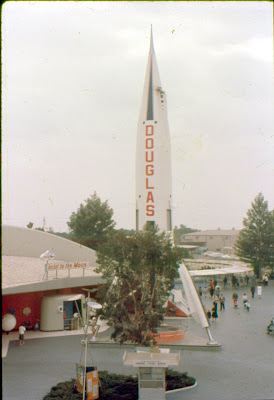 I see a ticket booth, attraction posters, the flying saucers and a super cool entrance to the Rocket to the Moon. 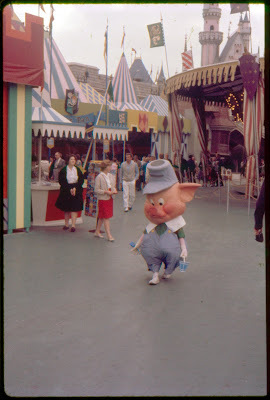 Come back tomorrow for part two (of four) as we enter Fantasyland. 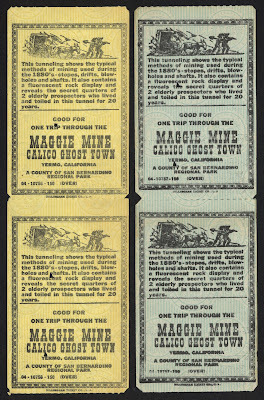 The slide below is actually about 32nd in order, but its so cool I just had to jump ahead and share it today. Simply marked "Candle Display - Disneyland 12/62" what a neat picture! Some of the slides in the upcoming posts from this series are really great (and some are grainy and dark) - stay tuned. Look what I saw yesterday at Disneyland! 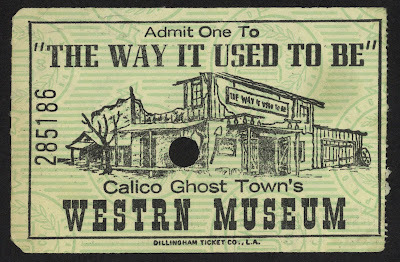 There was just one on the tract and no riders. 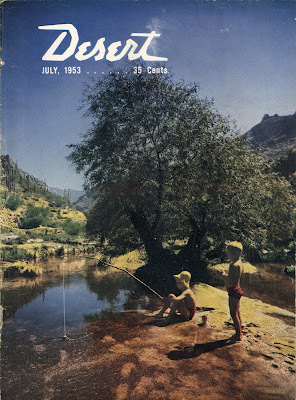 I'm not sure about the color, but what color should they be anyway? I do think they look pretty cool. 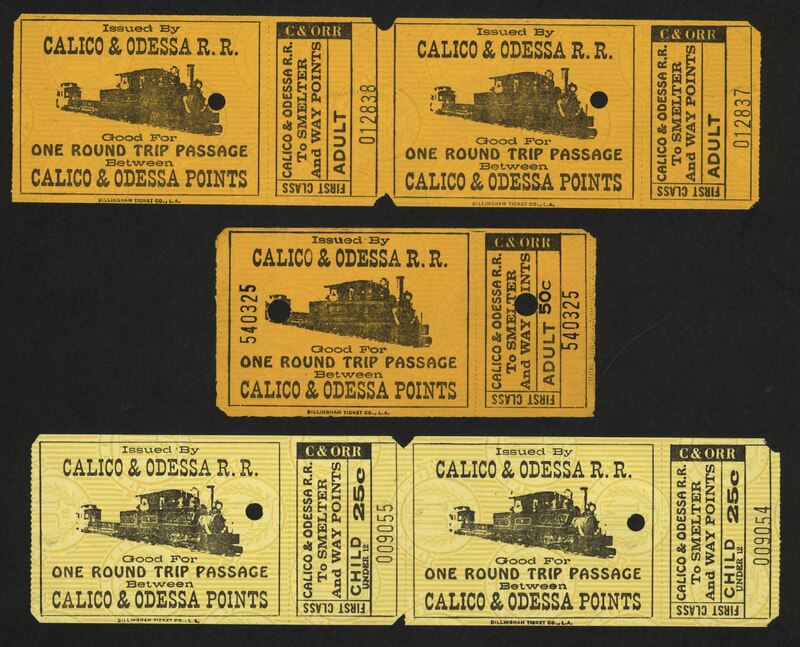 With Walter Knott still on my mind it seemed like a good time to post my Calico Ghost Town ticket collection. 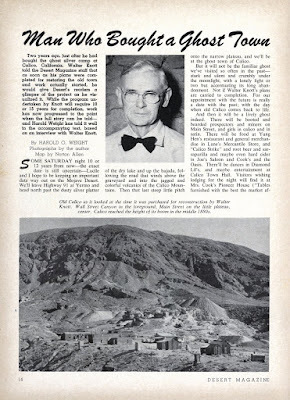 One Ghost Town wasn’t enough for Mr. Knott, he went and purchased a real ghost town out in the desert back in 1951. 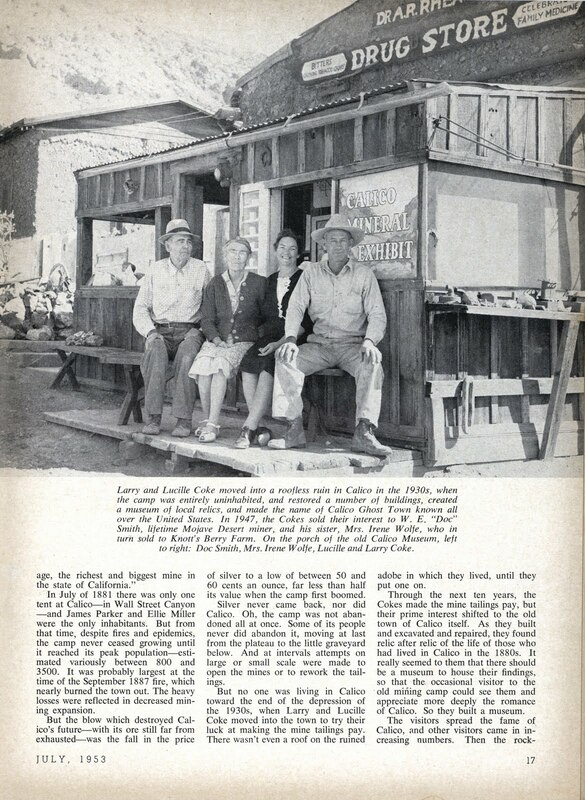 Check out Daveland's super vintage Calico photos page (link) on his excellent website. 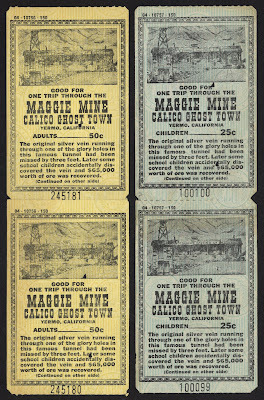 These Maggie Mine tickets look and feel (and smell) extra vintage. 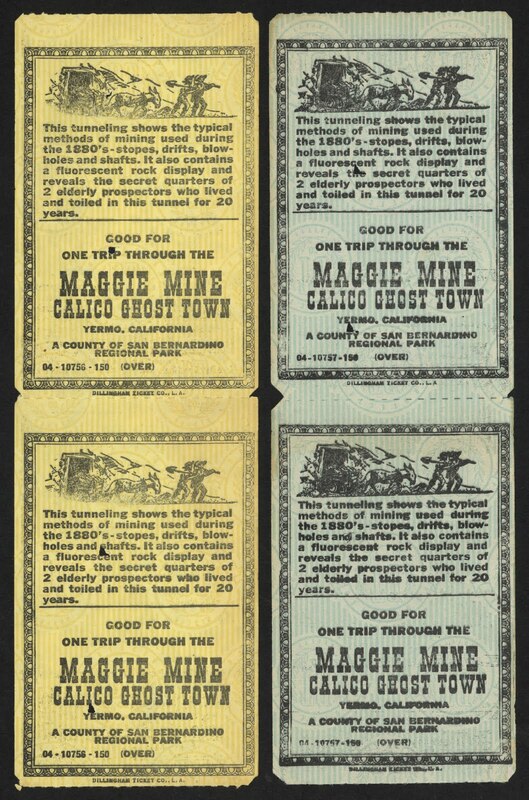 The tale of the mine continues on the back. 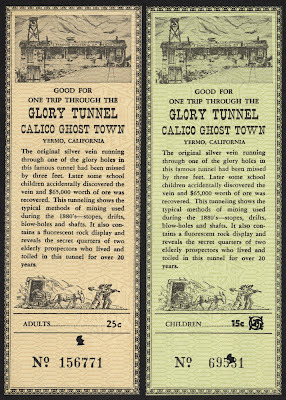 These tickets for the “Glory Tunnel” appear to be for the same attraction, maybe slightly newer? (I like this version better). 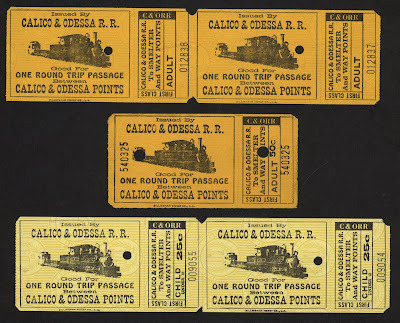 Here are some round trip tickets for the Calico & Odessa R.R. 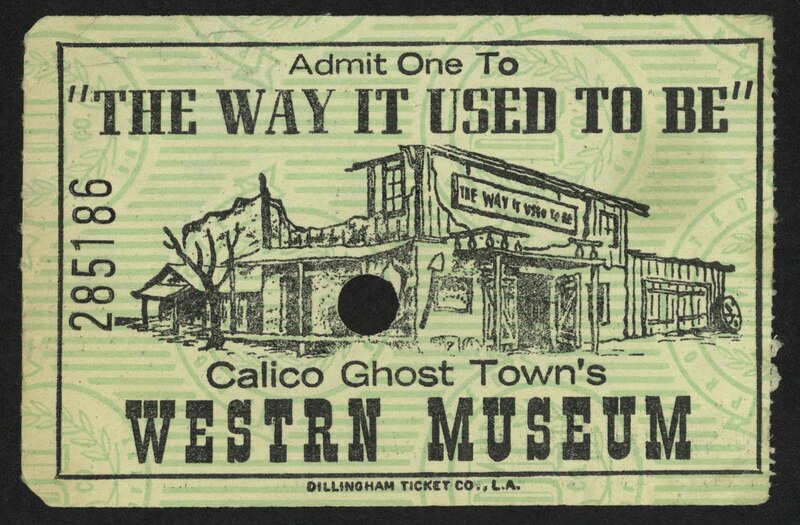 “The way it used to be” great name for a museum! 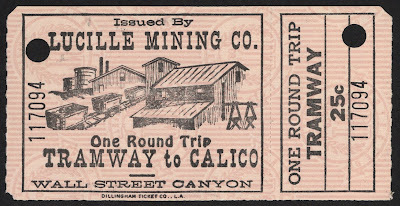 One round trip Tramway to Calico, did you get to ride in the ore cars? 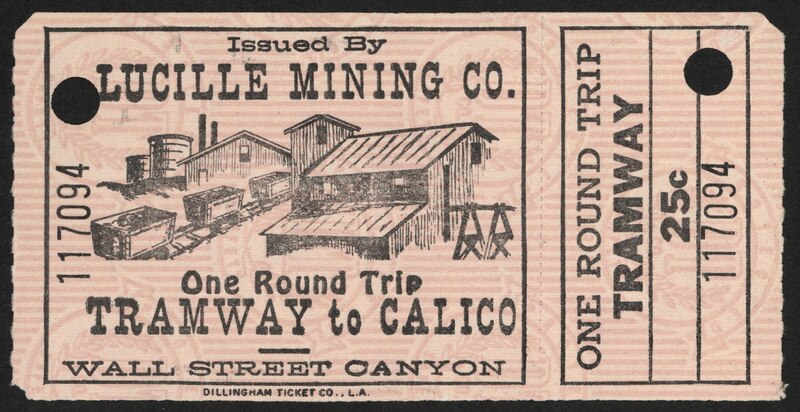 Notice all the safety paper is “Dillingham Ticket Co.”, while they are fun to look at, I prefer Globe Ticket paper, the Dillingham has a monopoly money look & feel to it. 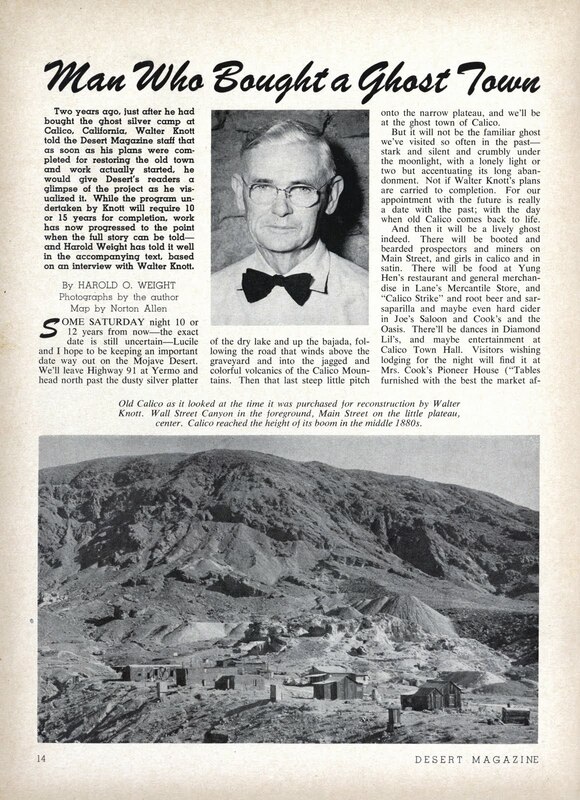 If you would like to learn more about Calico Ghost Town you can read the three small paragraphs on Wikipedia (link) of you can read this detailed article from Desert Magazine, July 1953. 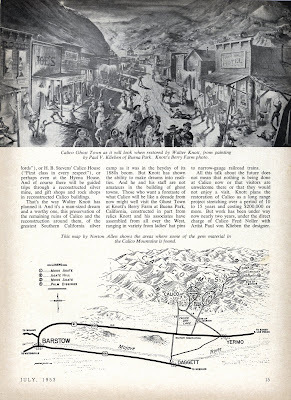 Besides a ton of information about Calico, its origin, history and Knott’s connection, there is quite a bit of information in here about Walter Knott himself. 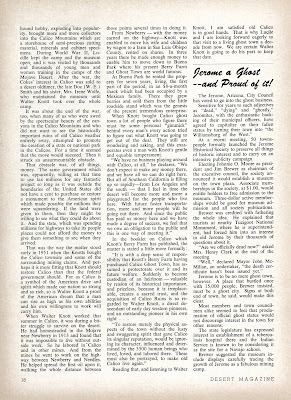 The American Weekly - March 1960. Guess where I am today??? 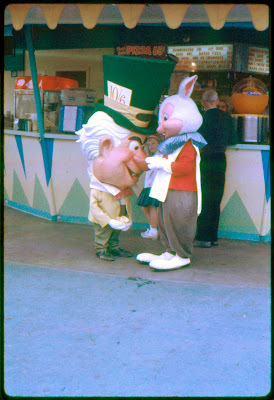 Disneyland Easter Party 1984 - Everybody Wins!